The Ranelagh Club has been a great factor in the expansion of polo. It is not too much to say that when Ranelagh was reopened in 1894, the future of polo hung in the balance. When therefore the two grounds at Ranelagh were opened the opportunity was eagerly seized on. Many of the members of Hurlingham joined the Club, and in a very short time there were plenty of players at both. The grounds were improved. The old ground was relaid, the new one enlarged, stabling was built, and the boxes engaged before the paint was dry on the doors. Then came the building of the pavilion, which has twice been enlarged and improved since. This pavilion was not, however, a mere luxury—it has had a great effect on the popularity of polo in London. A game is indeed first of all for the players, but spectators too count for much in the prosperity of cricket, football, and polo. 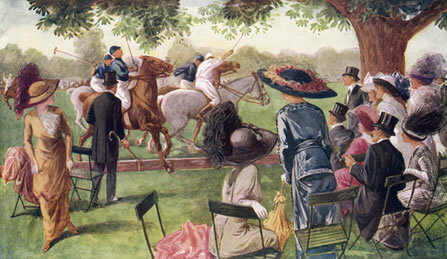 The taste for looking on at polo had to be created, and the Ranelagh pavilion, with its tea-rooms and its comforts, owes its success not so much to these luxurious additions as to the fact that it is by far the best place in London to see a match from. First class polo, if it is a genuine contest and not a mere exhibition game, is most attractive as a spectacle. The air is the only element which remains to man to conquer for his own use and enjoyment. 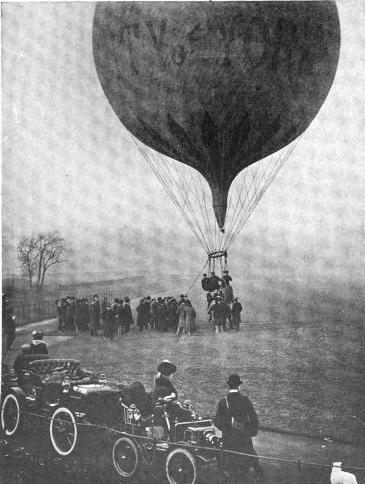 Consequently air ships are in the air, both in conversation and in fact; ballooning is the newest sport of the smart, balloon parties are the latest social departure, and membership of the Aero Club is sought alike by chic woman and scientific man. Balloons of great tourist tonnage are being devised. M. Santos Dumont meditates an air-ship on the lines of an Atlantic steamer, warranted to waft its passengers from Havre to New York within two days. Meanwhi1e, the Aero Club, of 119, Piccadilly, exists to encourage ballooning in all its branches, from scientific war-waging aerial machines down to delightful balloon trips for members and their guests, starting from picturesque Ranelagh, or the inaccessible Crystal Palace. Ladies are chivalrously admitted to all the privileges of the Aero Club, save the use of the Club house, which forms part of the Automobile Club premises at 119, Piccadilly. Rumour hath it that the Aeroists themselves would not deprive their soaring sisters of the privilege of their Club house were it not for the well-known monastic tendencies of the Automobile Club, which relegate the woman motorist to some sort of Car Cloisters, and deny her entrance Piccadilly, either mobilist. Few women have so far developed a taste for sky-sailing. But all who take a trial trip in the clouds become confirmed “balloonatics,” for there is no other sensation at all like it. No other pursuit or sport is quite so delightful as floating sky-high in a new atmosphere, discovering all sorts of lovely new scenery and cloud effects, and gazing down with a sense of superiority on the fussy small world below, which looks like a pitiful little Noah’s Ark farmyard set out for the amusement of grown-up Liliputians. The main objects of the Aero Club are to encourage all branches of aeronautics, and to organise cloud excursions for the benefit of members who care to take part in these fascinating trips. The Club at present owns a membership of nearly three hundred, has an aerial stud of three balloons, and intends to largely increase its sailing stable as its list of members grows. All congresses, races, contests, and exhibitions of aeronautic subjects and machines are held under its auspices; the Club also acquires grounds from which ascents may be made, and arranges for all the paraphernalia needed to inflate balloons with hydrogen gas, etc. Doubtless all sorts of delightful aerial tournaments will be held under its aegis within the next few years. A picturesque feature of this Club consists in the training of carrier pigeons to act as messengers between the clouds and the earth. In wartime such ballooning pigeons would serve a very useful purpose in carrying cipher messages to beleaguered towns and far-off troops. Indeed, ballooning, with its hundred sporting and pleasurable possibilities, is only in its tender infancy. And perhaps this is why it is so interesting, for who does not enjoy conquering a totally new world in this blase twentieth century, whose boast is that everything is played out? Ballooning, anyway, is not blast nor played out. It is fresh and young and fascinating; and the writer recommends it from personal experience as an ideal and alluring pastime. The Hon. Lady Shelley is a member of the Aero Club, and is ardently interested in ballooning. She is a daughter of Lord Llangattock, and sister of the famous motor racer, the Hon. C. S. Rolls, and is herself a keen motorist. Mrs. Templer, another lady aeroist, is particularly interested in military ballooning. Her husband, Lieutenant-Colonel Templer, has for many years commanded the War Office Balloon Factory, and has had most thrilling adventures in the air in India and many other parts of the world. He took charge of the balloon manoeuvres during the South African War, and the adoption ot military ballooning and the progress made in this direction in the British Army is entirely due to Colonel Templer. If you belong to the Aero Club you may buy the pleasure of a prolonged balloon sail for the very small sum of two guineas, ascending at your “own risk,” and with no claim on the Club for any personal damage or injury resulting from the excursion. Of course, the possibility of accident is slight, but this is a necessary self-protective clause for the Club. There are large shooting parties and small shooting parties, shooting parties to which royalty is invited and shooting parties restricted to intimate friends or relations, but in either case the period is the same, three days’ shooting. If a party is limited to five guns, seven ladies is the average number invited, the hostess relying upon a neighbour or a neighbour’s son to equalise the balance at the dinner table. The success of house-parties mainly depends upon people knowing each other, or fraternising when they are introduced or have made each other’s acquaintance. The ladies of a country-house party are expected, as a rule, to amuse themselves, more or less, during the day. After luncheon there is usually a drive to a neighbouring town, a little shopping to be done there, or a call to be paid in the neighbourhood by some of the party, notably the married ladies, the young ladies being left to their own resources. At the close of a visit game is offered to those of the shooters to whom it is known that it will be acceptable. The head game-keeper is usually instructed to put up a couple of brace of pheasants and a hare. But in some houses even this custom is not followed, and the whole of the game killed, with the exception of what is required for the house, finds its way into the market, both the local market and the London market. The first three weeks of September gives a hostess little anxiety on the score of finding amusement for the ladies of the party, as so many aids out of doors are at her command at this season of the year. 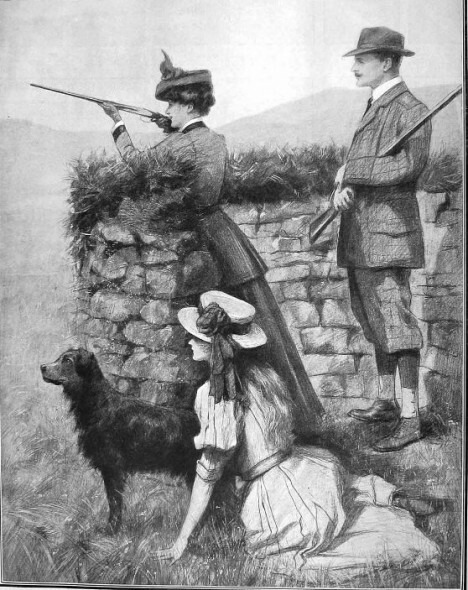 This is a great advantage, as although some few ladies possessing great strength of nerve have taken up shooting as an amusement and pastime and acquit themselves surprisingly well in this manly sport, yet ladies in general are not inclined for so dangerous a game, and find entertainment in strictly feminine pursuits, while even those intrepid ladies who have learnt how to use their little gun would never be permitted to make one or two of a big shooting party, even were they so inclined. Occasionally, when the birds are wild and sport is slack, a sort of picnic luncheon is held in the vicinity of a keeper’s lodge, under the shade of some wide-spreading trees, when the ladies join the party; but keen sportsmen despise this playing at shooting, and resent the interruption caused by the company of ladies at luncheon, and prefer to take it in the rough and smoke the while. Thus ladies generally have luncheon in the house at the regulation luncheon hour, and are not rejoined by the gentlemen until the day’s shooting is over, between five and six o’clock. Every day of the week is not thus given up to shooting, and there are few owners of manors who would care to provide five days’ consecutive sport for their guests, and two days’ hard shooting is probably followed by what is called an idle day. On these off days in September the hostess often gives a garden-party, or takes her guests to one given by a neighbour at some few miles distant, or she holds a stall at a bazaar and persuades her guests to assist her in disposing of her stock, or she induces her party to accompany her to some flower-show in which she takes a local interest; or the host and one or two of the best shots start early after breakfast to shoot with a neighbour, and the remainder of the guests drive over to a picturesque ruin, where they picnic, and return home in time for the eight o’clock dinner. If the owner of a mansion has a coach the whole party is conveyed on it, otherwise all the carriages are brought into requisition, from the barouche to the T-cart, while saddle horses are provided for those who care to ride.